Everyone loves laughing out loud. But people with dental plaque and tartar deposit on their teeth find it difficult to share a laugh publicly. The shiny and sticky film of bacteria on teeth can take away all the confidence of smiling or laughing in front of anyone. Even people with perfect denture and teeth structure find it difficult to laugh openly if they suffer from dental plaque and tartar. Plaque not just affects teeth, but also have the tendency to build up on crowns, dental filling, dentures, gums and tongue. In absence of any intervention,plaque can combine with minerals derived fromfood and form a hard, calcified substance called tartar. This sets a breeding ground for bacteria, which can eventually feed on sugar, resulting in production of an acid that destroys tooth enamel and dental cavities. It may even establish a ground for onset of gum problems. But there is nothing to worry about. People who have plaque and tartar build up on their teeth, dental feeling or dental implant can try out natural remedies for plaque removal at home to get rid of the problem that stops them from smiling freely. The key is to understand that the best way to prevent plaque is to stop it from building up at the first place. For this, it is important to visit a dentist regularly, brush teeth at least twice a day and use only a fluoridated toothpaste. Some of the best home remedies for tartar and dental plaque removal are discussed below. 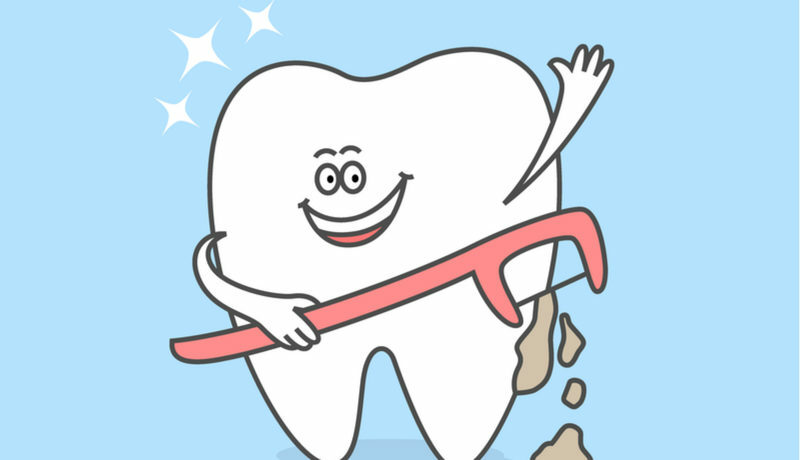 Remember, it is not a remedy that will help completely remove tartar and plaque. But it is extremely effective in eliminating then up to some extent. Flossing regularly, thus, helps prevent tartar build up and also reduced the risk of dental problems and other gum diseases. Baking soda is an age-old, yet most effective remedy for plaque and tartar removal. All you have to do is simply dip your wet toothbrush in baking soda and brush your teeth for at least 5 minutes each morning. You can add a pinch of salt to baking soda for more effective results. After spitting out baking soda, rinse out your mouth with hydrogen peroxide diluted in warm water. As a last step, rinse out your mouth with plain water. This simple remedy not only removes the existing tartar and plaque build-up, but also prevents it from coming back if practised at least once a week. Aloe Vera pulp is not just good for skin, but also for oral health as well. Take an aloe vera leaf and split it open to take out pulp. Apply this pulp directly to the gums and the regions of plaque and tartar build up. Rinse your mouth with cold water after 10 to 15 minutes, followed by regular brushing. Repeat at least twice a day for best results. Aloe vera not only kills harmful bacteria in the mouth, but also helps break plaque build-up. It may again sound strange, but rubbing the inner part of an orange peel on the gums before bed time and rinsing your mouth with water the next morning helps prevent plaque and also remove stains from teeth. It gives mouth a fresh feeling and also helps prevent bad breath. Guava and guava leaves contain antiplaque agents with analgesic and anti-inflammatory properties that can remove plaque if used regularly. To reap the benefits of this wonderful fruit, chew a few tender guava leaves thoroughly before spitting them out. You can also eating pieces of raw guava after sprinkling some salt over it. Rubbing a slice of food rich in vitamin C, such as tomatoes, strawberries and lemon, on your gums can also help remove existing plaque and prevent tartar and plaque build-up in the future. All you have to do is rub other of these food items on your teeth and gum and let the juice stay for five minutes. Next, rinse out your mouth with baking soda dissolved in warm water.